It’s no secret that Intel’s Atom processors don’t back enough punch to keep up with the big chips in desktops and gaming rigs—but then, they weren’t supposed to, either: instead they’re intended to bring enough oomph to handle common communications and Internet tasks without draining a netbook battery in less than 20 minutes. But now new computer maker Haleron seems to be thinking where one 1.6 GHz Atom processor isn’t enough, maybe two will do the trick: the company’s new Swordfish Net 102 Dual sports dual Atom processors, along with 2 GB of RAM and a 10-inch 1,024 by 600-pixel LCD display. Haleron boasts the Swordfish N102 Dual is the fastest netbook on the planet—and they may be right, but that’s akin to claiming to be the tree sloth with the least moss growing in its fur. But the N102 Dual seems to pack some features: in addition to two Atom processors, the unit packs a 1.3 megapixel webcam, 2 GB of RAM, a 160 GB hard drive, 100Base-T Ethernet, a 4-in-1 card reader, 802.11b/g and “dual Bluetooth” wireless networking, and three USB 2.0 ports. 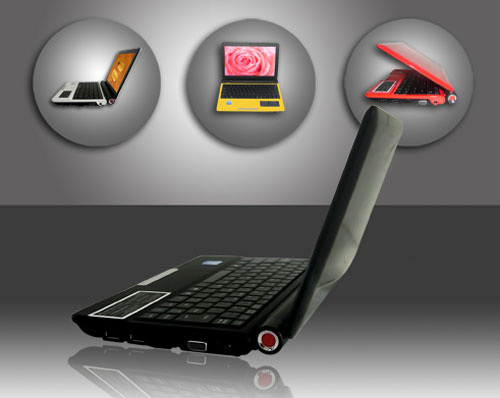 The netbook can also accept a 3G quadband WCDMA sim for wireless broadband connectivity . The system runs Windows XP Home, with a Spanish version available as an option. Haleron is offering the Swordfish N102 Dual with a one-year warranty for $449. Of course, finding applications that can take advantage of two Atom processors…that might be the real trick.